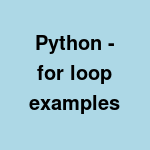 Frequently used python for loop examples. Iterate over dictionary keys, values or both using iterators. This does not create a new copy and may be little more memory efficient for large dictionaries.